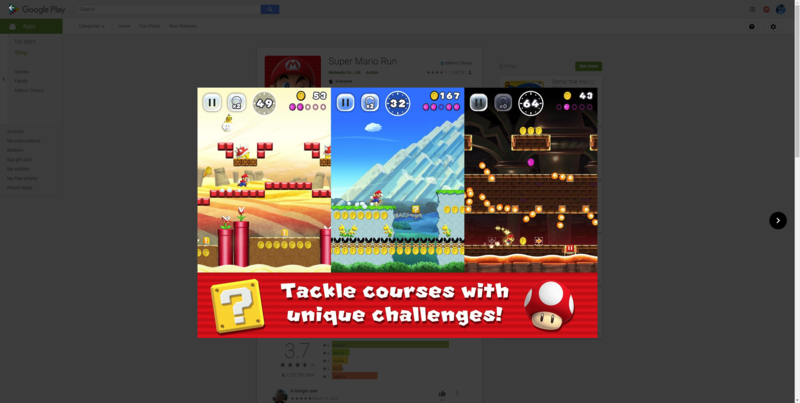 A couple of weeks ago, Google started rolling out a new Play Store redesign on the web. On the face of it, it looked a little cleaner, but try to use it for one minute and you'd hate everything about it. Now it appears that Google has pulled it back. None of us can get the new design to show up again, regardless of how many listings and browsers and devices we try on; we're all back to the previous Play Store look on the web. If you're wondering what all the hate is about, just ask Matt or Artem or me. We visit dozens, if not hundreds, of Play Store listings everyday on our computers to bring you the best new releases, and navigating the new design was, to put it mildly, atrociously slow and convoluted. Scrolling through the screenshots was janky. Image loading was an exercise in futility: compressed webp images were gone and it was serving jpgs and pngs instead, plus the fullscreen image viewer was loading the largest available resolution not a smaller version and it was preloading all images instead of on-demand. Keyboard navigation of these images was no longer possible, so you had to use the mouse, and you had to hunt for the tiny back arrow on the top left to back out of the viewer. That is not to mention the infuriating back button behavior where reviews required you used your browser's back button but images had their own button on the interface. Clearly, there were some issues with the design and it wasn't fully thought-out. We don't know what the reasoning behind Google pulling it back is, but we hope it's so these problems could be fixed and the experience could be streamlined and unified across the different UI elements.